The story of Ray Lewis is a touchy one. The star Ravens linebacker had a Hall of Fame career on the field but a wall of shame history off the field. In Bloody Shakespeare's Richard the Third and Goal, or R3G, Richard III and Lewis are strategically mashed up, quite like the events of that tragic night that made Lewis the polarizing idol he is. 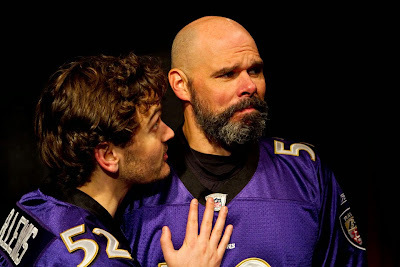 Written and directed by Neal J. Freeman, Richard the Third and Goal is a clever twist on the classic Shakespeare drama that combines the Bard’s words along with Ray Lewis’ that makes for a comic spin about idol worship and the thin line between hero and villain. With football as the backdrop, Richard III is put through the gauntlet and Freeman does a fantastic job combining the two worlds. Regardless of your opinion of Ray Lewis, the comparisons of the two men are strikingly similar. Bad guy or not, he pursued his mission of fulfilling his goal. Power and ambition are dangerous and when they are chased, inhibition is out the window. Freeman smartly pokes fun at Lewis’ history without forcing it to become farcical. With that being said, knowledge of Ray Lewis and his off field antics is necessary for the full affect. The world Freeman devised was filled with fanfare and fun. His direction was equally matched. Less is more and it was perfect for this production. Unlike a football game, he kept the momentum up and moving from scene to scene, helped greatly by the quick whistles and cheers. Freeman used very little props and the ones he did use were smart choices. There was not a single element that was overdone which was greatly appreciated, allowing for the concept to be the shining star. Well, besides the stellar cast. The trio of actors were flawless, always ready and able to switch between texts and styles. Patrick Toon, who took on the Richard/Ray concoction, studied up on his Lewis-isms, emulating him to a T. He portrayed Lewis’ vocal inflections and tempo fascinatingly. He never appeared as caricature and yet he was hilarious. If you know Lewis and his victory dance, you’ll be shocked at how well Toon rivals it. Toon’s performance is something not to be missed. Montgomery Sutton as a trio of rivals and adversaries nailed the comedy. He was a perfect opposite for Toon. Sutton brought in some of the biggest laughs of the evening. Minna Taylor, also getting a trio of characters to play, found the funny through her expressions. The chemistry that Toon, Sutton, and Taylor made Freeman’s job as a director quite easy. Richard the Third and Goal is a story of legacy. Who knew finding humor in Richard III’s story was possible. But adding the element of Ray Lewis was a smart choice that made this piece stand out in the Shakespeare update world. If anything, this play will make you want to look into Lewis’ story further and decide whether he is a hero or villain.